It was praised by visitors such as Abdullah al-Idrisi and Ibn Al-Gubayr. Gennàt al-àrd, pronounced Genoard during the Norman epoch of Sicily and meaning "Paradise on Earth" in Arabic, was the name of the extensive park that the Norman kings of Sicily had the Arabs create for them with palaces, pavilions and fountains behind and beyond the Norman Palace of Palermo, their capital, extending towards the city's vast fluvial valley. Even before this park existed, the countryside in the Valley of Palermo, surrounded by a natural amphitheater made up of hills and mountains, was a miracle of flora and fauna, thanks to its fertile soil and its rivers and springs. Beginning in the ninth century, long before the Norman conquest, the Arabs had introduced new irrigational and agricultural techniques in the valley, and they also planted citrus groves, which thanks to the orange and yellow fruits would later earn the valley its nickname Conca d'Oro, meaning the Golden Conche. The valley was so well irrigated that it was even possible to grow rice. Though rice has not been cultivated in Sicily for five centuries, but this culinary tradition survives in arancine, or rice balls. While the precise extension of the Genoard park is unknown today (the following map traces its approximate boundary), it embraced a series of streams and kanats (underground irrigation systems) linked to the Arab-style palaces built in the valley for both the Arab emirs and the Norman kings extending to the base of the mountain where Monreale is located. It should be remembered that Monreale during the twelfth and thirteenth centuries was little more than a small hamlet built around an abbey. Though the oldest of these palaces was about two miles east of the Genoard, it is worth mentioning. The Favara, also known as Maredolce in what is now the Brancaccio district of Palermo, was built by Ga'far, the last Emir of Bal'harm, at the end of the tenth century. The name derives from the two fresh water springs (fawwàra in Arabic) that supplied water to the area flowing down from the nearby mountains (Mount Grifone) and the Oreto River. These natural springs allowed the creation of a man-made, fish-stocked lake large enough for small boats. This castle was also surrounded by a park. Later Roger II (king from 1130 to 1154) added a private chapel, dedicated to Saints Philip and James, inside the palace, this being common for the Norman monarchs even in buildings considered temporary residences. Onlya few walls of the Favara remain, but it is important because it was the prototype of palaces constructed later. King Roger II would sojourn in the Favara during the Winter and during Lent, while during the summer time he preferred to stay in another palace he had built in the southeastern hills of the Conca d'Oro overlooking his hunting grounds amongst what were then lush forests encompassing the environs of Monreale and Baida, extending across the Molara district (now in the township of Altofonte) and across the valley to Altofonte, another hilltop town. Until the twentieth century Altofonte bore the simple name Parco because it had been a tiny hamlet in the royal park. Its tiny Norman chapel of Saint Michael is the oldest structure there. Both the Cuba and the Zisa castles were erected by William I "the Bad" (reigned 1154-1166) or his son William II "the Good" (who was married to Joan Plantagenet of England). The Cuba, a square building - "cubic" as its name suggests - beyond the old city walls near a Punic burial site (a number of Phoenician and Carthaginian necropoli dot the area around what is now Corso Calatafimi), was used as a pavilion during concerts and perhaps even jousts. 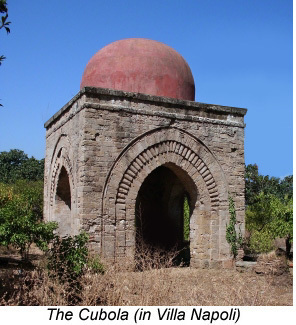 It was surrounded by shallow reflecting pools and included a number of smaller, square, domed buildings similar to the Cubola (pictured above) near what is now Villa Napoli. It is thought that there were as many as twenty of these structures around the Genoard. The Zisa castle was a much more complex building used as a summer residence by the last Norman Kings and possibly as Joan's residence immediately prior to her wedding to William II. This castle, built by Arab architects, had its own air conditioning system, including a fountain hall (an iwan with a fountain) where you can still admire some mosaics from the Norman period, at least six separate apartments (two per floor) each fully equipped with their own latrine and running water, an atrium on the upper floor for collecting rainwater with a cistern and, next to the building, a private chapel which still stands, as well as a hammam (a traditional Arab-style bathhouse and sauna). Though inspired by the gardens of the Genoard, today's Zisa Gardens seem a bit too modern. The much smaller Scibene palace is - at least in part - from this same period, but the oldest part of the building is contemporary to the Favara and predates the arrival of the Normans in Palermo by at least a few decades. Although access to this largely-destroyed building is restricted (it is on private property), it was quite similar to the Zisa, featuring an iwan-like fountain room. To paraphrase Ibn Al-Gubayr, these Arab-style palaces were like "jewels on the neck of the stunning lady" which was the Genoard park. Surrounded by lakes, artificial streamlets and fountains, they were equipped with complex cooling systems and internal water ducts. Indeed, they were all built on the model of the typical Arab àgdal outside a city with a fountain representing the spring of Paradise set in a small lake surrounded by gardens. Another contemporary chronicler who made reference to the Genoard and its delights was Peter of Eboli, a monk. The Genoard had an incredible variety of flora and fauna. There were both common and exotic plants, bushes and trees such as palms, plane trees (sycamores), citrus (oranges, mandarins, lemons, citrons), almond, pistachio, chestnut and walnut trees, wild olive and fig trees, myrtle and laurel. There was also papyrus and sugarcane growing along the streams and the two rivers - the Kemonia and the appropriately-named Papyrus or Papireto. The scent of jasmine and other blossoms was everywhere. The fauna in the Genoard "zoo" included exotic birds such as parrots and peacocks, migratory birds such as herons, flamingos and the purple swamp hen, but also turtle doves and pigeons.  There were reptiles and Nile crocodiles, and among the mammals present the more exotic ones such as monkeys and (it is said) giraffes, leopards and lions. A vast hunting reserve and scattered woodlands lay beyond the Geonoard. Here were deer, hare, rabbits, pheasants, grouse, partridge and black francolin as well as a few small wild cats and hedgehogs. Foxes, wolves and wild boar also thrived here. The woods were comprised of ashes, oaks, birches, and some conifers - perhaps even a few Nebrodi firs. In Sicily, as in Normandy and England, the Normans loved to go hunting - usually on horseback. Even falconry was undertaken on horseback. Frederick II wrote a lengthy treatise on this avian sport of kings. 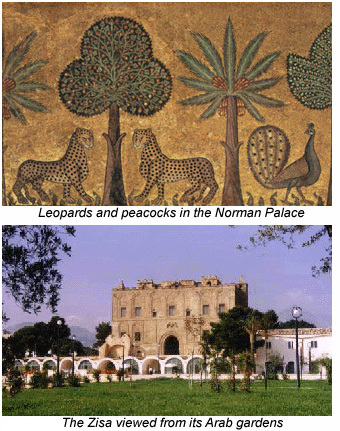 The Genoard with its palaces, castles, pavilions, lakes, streams, bathhouses and the bordering hunting grounds, was truly an earthly paradise for these Norman and Swabian rulers who had originally arrived in Sicily from lands in Europe where the way of life was anything but Arabic or Mediterranean. One instance of this can still be seen in the upper apartments of the Norman Palace. "Roger's Chamber" is a fine example of an Arab iwan inserted in a riyàd, an artificial rendering of a Koranic paradise within an enclosed and built-up space in a city, and it gives us a vivid artistic impression - in timeless mosaic - of some of the creatures and plants in the nearby Genoard. What little remains are masterful renderings of palm and fruit trees, exotic and forest animals, archers and hunters - all illustrated in perfect symmetry with each copied next to the other as if it were its own reflection on a mirror. There exist descriptions indicating that there was much more to these chambers in the past. It has been hypothesized that there was a fountain at the entrance of the room in the middle of the open tower. With or without the fountain at its entrance, "Roger's Chamber" represented Paradise as described in the Koran. As mentioned previously, the room was an iwan and in fact it still has its square-ish shape with an open side facing towards the atrium (and possibly the fountain) like an iwan should. All this was created for the Norman king's delight as if he were an Arab sultan or an Emir in his palace overlooking the city of Palermo. The entire structure dates from the rule of Roger II, but some scholars believe that "Roger's Chamber" was actually decorated during the reign of his son, William. Another part of the Norman Palace seems to allude to the Genoard's delights. On the ceiling of the Palatine Chapel, various animals are depicted. Were there camels in the Genoard? Quite posssibly. Overlooking the Genoard - and visible from it - is Monreale's cathedral and cloister, whose fountain resembles those which once existed in the park far below. 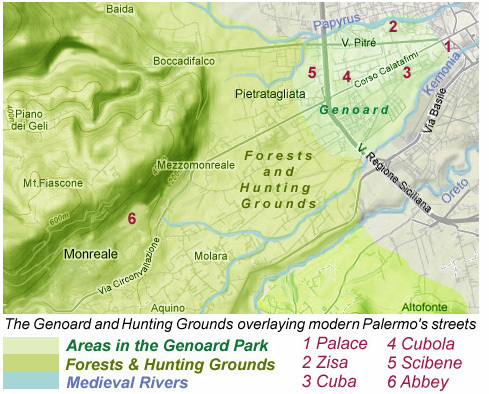 Despite Palermo's uncontrolled urban sprawl, a few of the Genoard's jewels await you.